It could be a sign of renewed activity within the Zeppelin camp. Or it could mean nothing at all. Regardless, the band have posted a batch of rare concert videos of themselves on their very own YouTube channel. 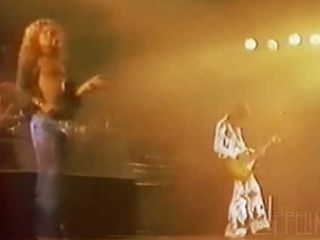 The videos - and there's many incredible moments to be found - are mostly bootlegs (once considered anathema by the band), converted from scratchy Super8 film, of Led Zeppelin performing now-legendary shows. Want to see Zep in San Francisco in 1973? Done. How about this concert, one of their last, from Munich in? One could spend hours sifting through all the gems, such the infamous Oakland, California concerts from 1977, all of the Los Angeles shows from 1975 and 1977, Philadelphia 1975, and Iceland 1970, among many others. There's a bit of fascinating footage from a Houston concert in 1971 that shows the audience arriving early and walking the perimeter of the arena's auditorim. A neat little time capsule, to be sure. And, as always, Zeppelin explodes onstage. Check out all the videos on the official Led Zeppelin YouTube channel.